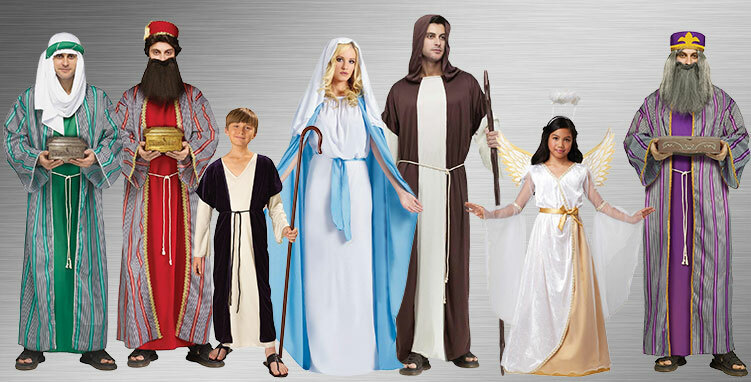 Recreate the nativity, and get some wonderful looks for your next church play with this collection of Religious Costumes! You can also dress up as an angel or a shepherd for your next Halloween costume party, and there are lots of accessories to help you create the perfect look, like wings, staves, harps, and more! What better way to prepare for Christmas than by celebrating on Halloween, dressed as one of the inspiring figures from the Bible? 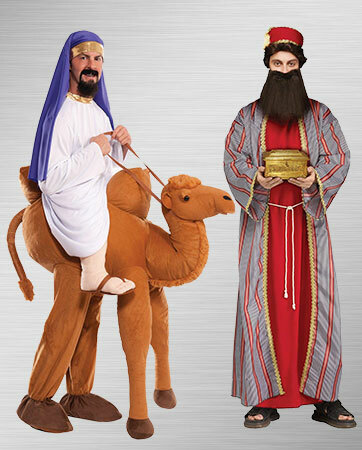 While you might have to look elsewhere for livestock and a manger, we have costumes for Joseph, Mary, Jesus and even a wise man. Each costume is made with care to replicate an authentic look for anyone in your family, big or small. If you want to make things a little more interesting, you can’t go wrong with our medieval monk or the adult nun costume, both of which bring together a mix of the sacred and the profane. Behold, he has returned onto this world, bringing good tidings and a whole series of new dance moves. When you’re dressed as someone who’s known to turn water into wine, you can’t help but get some attention. The costume comes with a beige robe, red sash, wig, beard and a kingly crown of thorns. Honorable and dutiful, two words that fit you perfectly and so naturally. You are Joseph, the husband of Mary and Jesus’ foster father, and this is the perfect outfit for you. In this simple robe and brown caftan, you’ll be able to travel through the eastern reaches of the Roman Empire. Sweet Mary, Mother of God, goodness and purity have never looked as good as they look on you. No simple bunch of rags will do for the immaculate mother of Jesus. This costume evokes the grandeur and compassion of the Madonna with an ankle-length blue gown, blue robe and white head piece. The writer of laws, the baby in the basket, there’s not much about the story of Moses that fails to inspire people. Your little guy might not have Charlton Heston’s booming voice, but he’ll be a leader of the people in his own right. The costume includes a short-sleeved orange robe and a soft polyester under-robe, tied together with a rope belt. For many, this may be the most frightening costume we have. If you carry a ruler, you’ll be sure to strike terror into the hearts of all the former Catholic school girls and boys. With a gown, veil and collar, this costume has everything you need to get into the habit of having a good time. Tell your driver to get the Pope-mobile ready, as you’ve got some blessings to give out at a few parties. And nothing says you’re ready to party like donning a Mitre and muttering Latin phrases. 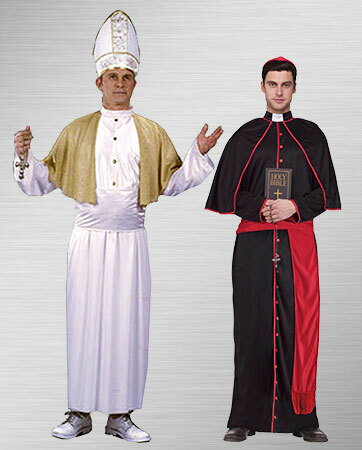 With the white robe, sash, gold capelet and hat, you’ll have everything you need to dress as Christ’s vicar on earth. Bless the sacraments and prepare the host, because after tonight, a whole new set of sins will need to be forgiven. 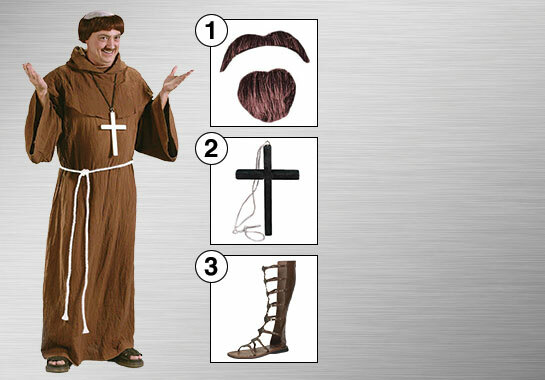 Our priest costume is a miraculous outfit that fits most adults. The lightweight cassock is cozy and gives you a heavenly amount of space to breathe and move. What kind of trip to the Holy Land is complete without a ride on a camel? Saddle up and get ready to explore the outer regions of the desert in this outrageous costume. Perfect for many occasions, your little one will love the stuffed camel that comes with attached legs and sandals. Step back to a time when shepherds were the fast food workers of the world. Still, maybe the open air and sun made the days a little more enjoyable. Our youth shepherd costume is perfect for plays, pageants or parties. The long brown robe goes over the soft tunic and is fastened together with a rope belt. They traveled widely, bearing gifts that they just don’t sell at your local five-and-dime. This costume will show how wise your little one is for his age. The exotic look comes with a blue tunic, silver sash and hat. The Myrrh, gold and frankincense are all sold elsewhere. For many schools and churches, it’s a time-honored tradition to put on a Christmas pageant. 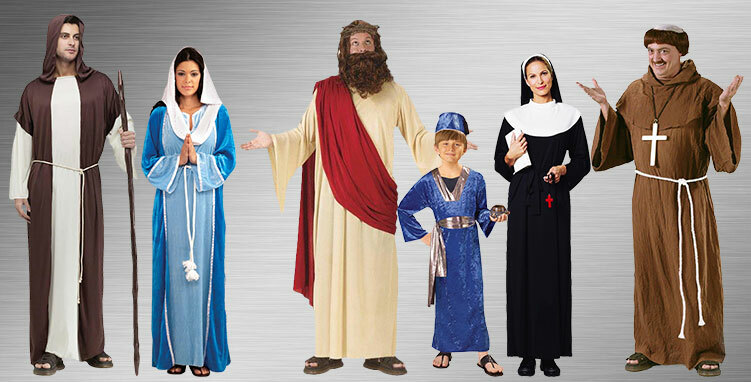 With a wide selection of costumes for every major character, we’ve made it easy for you to select the right costume and put on a perfect nativity scene. The three wisemen costumes are all distinct and differentiated by colors to add an authentic effect. 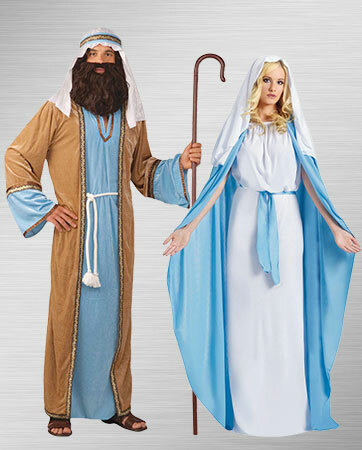 The shepherd and angel costumes are perfect for the young ones to gather around in. With Mary’s beautiful robes and Joseph’s simple and honest outfit, we have all the costumes you need to give your pageant an authentic feel and make this Christmas one to remember. Enter the halls of papal power dressed in the all the finery of the Vatican. Call up your number two and let him know that things are going to be a little more holy this Halloween. The Cardinal costume comes with a full-length cassock, capelet, sash and cap, and the Pope costume comes with all that but a Mitre instead of a cap. How out of control can this pair get? Well, it’s up to you, but one thing’s for certain – someone will have to go to confession the next day. 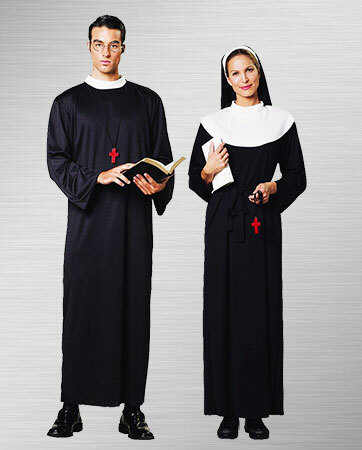 The nun costume will get you in the partying habit with a gown, veil and collar. The priest’s costume includes a lightweight cassock that gives you room to breathe and move around. It’s a lot to live up to, but if you think you and your sweetheart can be like the most prudent and wholesome couple in history, then we have the costumes for you. Next to Joseph's humble white robe and brown caftan, Mary glows in an immaculate blue robe with white headpiece. These two costumes are for the devoted pair who are ready to take the ultimate road trip. The adult Ride-a-Camel costume puts you on the equivalent of a biblical motorcycle and includes a stuffed camel with attached legs. The Wiseman costume comes with a robe, attached belt and headdress. The monks of the middle ages took a vow of poverty and lived simply. (How else could you live, though? It was the middle ages, after all.) But that doesn’t mean they didn’t pay attention to details. To replicate their look, we brought together the finest in medieval style. It begins with the moustache and goatee, a simple application that adds wisdom and holiness to your boyish features. What would a monk be without a cross? We have that accessory covered. Finally, the most stylish part of a monk’s wardrobe is the footwear. These tall, buckle-up sandals will give you a saintly, maybe even gladiatorial, look.